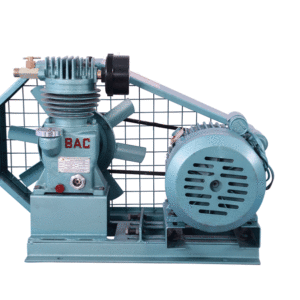 BAC compressor one of the leading manufacturers and suppliers of monoblock pumps in Coimbatore. 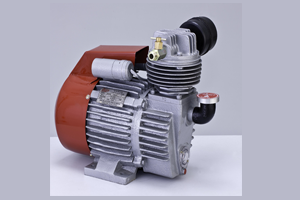 The monoblock borewell air compressor pumps are designed by our quality experts with advanced features. BAC’s 1 HP borewell air compressor are energy efficient and compact in size. BAC monoblock pumps are made from high quality parts and unique in design. In this design the motor and compressor shaft directly coupled hence it is also known as direct coupled compressor or coaxial compressor. BAC monoblock pumps are made for compact to fit in tight spaces compared to a traditional belt driven compressors. The fan blades are toughly sealed offering more safety to users. Unique in the industry BAC 1 hp borewell compressor offers focused cooling technology that focus cooling on the cylinder and head offering significantly longer operating cycles compared to other brands. 1 hp borewell air compressor pumps have been manufactured to draw water from the depth of 100-400 feet. Discharge capacity of water varies from depth of bore. Specially manufacturers to run effectively in the field of agriculture and domestic purpose. Our monoblock borewell air compressor pumps discharges water effectively at low power consumption. BAC compressors monoblock air compressor have served small and large homes for decades with reliability and customer satisfaction. 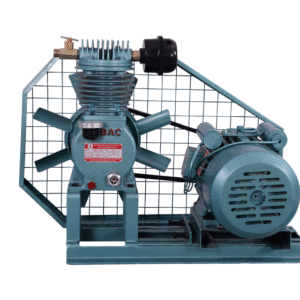 BAC prominent manufacturers of 1 hp borewell air compressor at affordable cost. Small in size allows it be placed in small areas such as under stair cases, etc. Shell Moulded grey iron casting with extra large fins for better cooling. The cylinder consists of a special diamond hatch pattern honing which allows the oil to stick around the inner walls while running reducing the friction and increased life. IPL make 1 compression ring, 1 scrubber ring and 2 oil ring assembled for better performance. Graded middle plate with both sides grounded using superior surface grinding operation to prevent any leakage of air during higher pressure and temperatures. Special grade Stainless Steel valve blade for faster opening/closing during suction and delivery and to withstand at higher temperatures. Large head fins for better cooling. Large cooling fan which is dynamically balanced for lower vibrations.